While most of the recent economic data seem to demonstrate a steady, albeit slow recovery in the United States, the November employment figures from the Labor Dept. threw a curve ball into the mix as the unemployment rate unexpectedly jumped to 9.8% from 9.6% held since August. That brought the jobless rate to its 19th straight month of 9% or more, which is the longest stretch since World War II, while the unemployment rate of people with a college degree (25 and older) also hit a 40-year high of 5.1%. Economists estimate that 120,000 new jobs a month are needed just to keep the unemployment rate flat, and it will take up to 300,000 new jobs per month to reduce the unemployment rate significantly. However, in November the private sector added only a paltry 39,000 jobs, mostly from temporary-help and healthcare sectors, contrasting with the 172,000 new jobs added in October. The major red flag is that the labor market weakness seems to have stretched across industries, with retail, construction and manufacturing all shedding jobs (Fig. 1). Some dismissed this as contradictory to other more upbeat employment figures, and that one month does not make it a trend. Regardless of whether it is a trend or a fluke, things could be set to get worse, according to the Hackett Group, as globalization, automation and processes improvement have created a “perfect storm” for a jobless recovery, particularly within the four business support functions − Finance, IT, Human Resources and Procurement. While most news headlines and political debate are primarily centered on manufacturing jobs “offshored” and outsourced to low-cost countries like China and India, the next major wave of offshoring is going to hit the white collar professional jobs in North America and Europe. Based on a new study by the Hackett Group, close to 1.1 million jobs in corporate finance, IT and other business functions were lost at large U.S. and European companies in 2008 and 2009 due to a combination of offshoring, productivity improvements, and lack of economic growth. 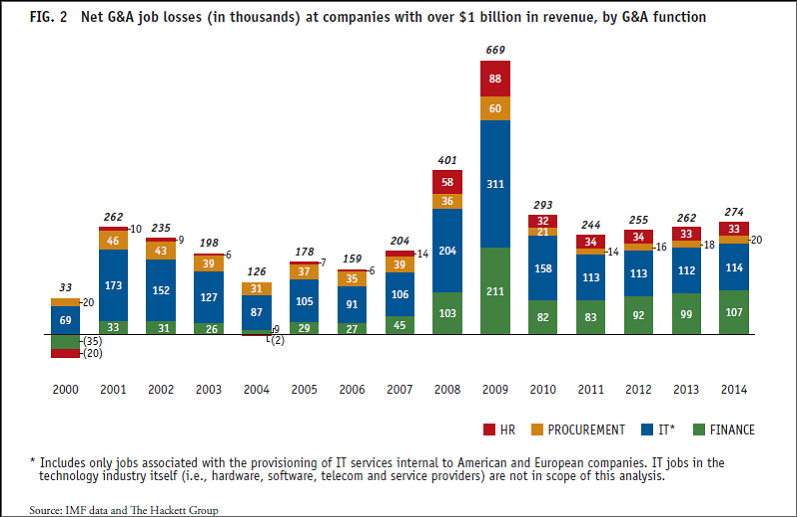 Hackett now projects over 1.3 million additional jobs will disappear within the four business support functions − Finance, IT, Human Resources and Procurement − by 2014, with offshoring becoming a larger and larger factor (Fig. 2). 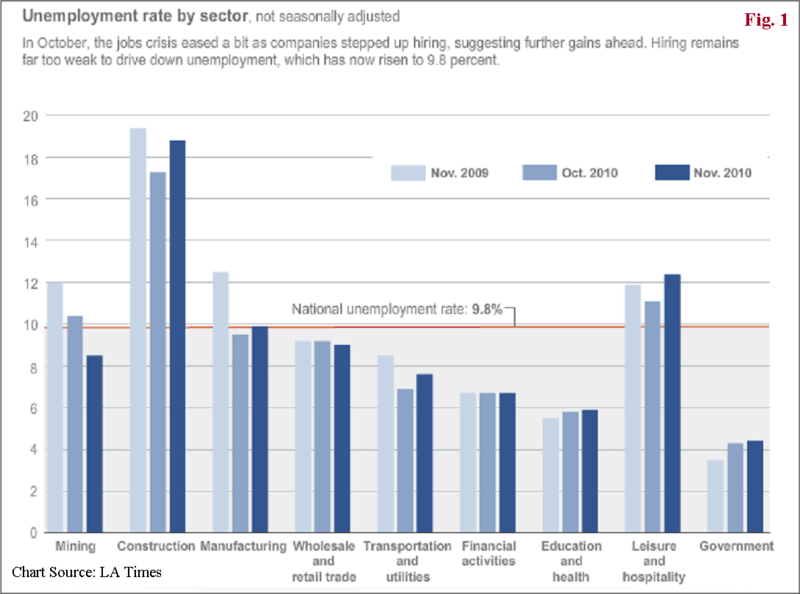 These figures represent annual job loss rates of close to twice those seen from 2000 to 2007. While the recession contributed to a staggering net loss of 669,000 jobs in the four groups in 2009 alone (Fig. 2), these disappearing acts are driven largely by a structural, longer-term trend of ongoing business model innovation, a deepening and broadening skill set from offshore, and increasing levels of automation that started over a decade ago. The only bright spot is that due to this shifting labor market trend, Hackett predicts several types of skill sets will be in high demand, including those in transformation, global management and relationship management. As a result, there will be an imbalance with critical shortages and demand for skills in some sectors, while others will have large surpluses. The Hackett findings also concluded that jobs created in the four job groups through economic growth would most likely be offset either through improved productivity or a move offshore. Since the financial crisis, companies have been able to squeeze out more productivity by cutting headcount and hiring temps, while investing in new technologies and equipment to improve efficiency. Furthermore, with brighter business prospects shifting overseas, corporations increasingly are setting up shops outside of the U.S. to be close to either suppliers or customers. Meanwhile, U.S. stocks had a very mild reaction to the downbeat unemployment figures and ended the week higher, and followed up with a Monday Bernanke bounce after CBS aired the interview of the Fed Chairman on 60 Minutes. While Wall Street seems to deserve a round of applause for such composure, the renewed chatter and expectation of QE3 suggest this is actually an indication that the stock markets are hooked on the pure crack of liquidity and stimulus. On 60 Minutes, Bernanke certainly did not disappoint Wall Street, and hinted further expansion of the central bank’s asset-purchase program was possible. Meanwhile, some experts believe a weak dollar may boost exports and actually help the U.S. economy to become more competitive over time. So, could dollar devaluation reverse the jobs loss predicted by the Hackett Group? Unfortunately, Hackett indicates that while a dollar devaluation could potentially shift the offshoring dynamic, it is unlikely to redirect this structural trend driven by the business needs of globalization, rationalizing job skills and economies of scale, and thus would have little impact on the projected sum total of 1.3 million job losses by 2014. A recent Bloomberg article talked about “leakage from quantitative easing (QE)”. That is, American as well as foreign firms are increasingly tapping the U.S. market for the Fed’s cheap money, but instead of generating domestic jobs the money is actually invested away from the U.S. and into emerging markets, commodity-based economies, commodities, and non-U.S. opportunities. So far, it is abundantly clear that most of the past two years’ worth of QEs − the Fed bought $1.7 trillion of bonds in QE1 and is now buying a second batch of $600 billion − is not trickling down to the real economy to create jobs as intended. The easy Fed money is instead fueling Big Banks’ speculative buying binges of commodities, incentivizing QE leakage, and thereby brewing another “perfect storm” for stagflation, that is, high inflation coupled with high unemployment. This underscores the difficulty of monetary policies to actually result in adding jobs. QE3 is likely a déjà vu of the previous two rounds − feeding Wall Street’s QE addiction, market bubbles, sending the dollar into a continued debase, while pushing the economy further into stagflation. On that note, I think Bernanke would be greatly disappointed since he’s betting on QE2 to create 700,000 to 1 million jobs over the next two years, whereas his loose policy will only disservice the economy, as well as the 15.1 million unemployed. Source: Dian Chu, Economic Forecasts and Opinions, December 7, 2010.